The Wirie sits high in the sky! The first person I ever met who was interested in sailing was a customer of mine at a bar called Cheers where I worked in 1996. He was a middle-aged Bruce Coburn listening, greyhound adopting, guilt ridden liberal from Maine. He would come to the south every few months or so on business. He loved Greenville, where he got to carouse with un-politically correct, womanizing, hard drinking self proclaimed rednecks. He was in an unhappy marriage with 2 teenaged children and a â€œoopsâ€ baby, just 5 years old. When the youngest was out of school he planned on falling off the grid and sailing away. I was aghast and told him that he couldnâ€™t do that, he couldnâ€™t just leave his family and disappear out into the ocean. Of course, this was before I had my boating epiphany and my sailing adventure, but still, I guess, it is rather ironic that only 4 years later I was contemplating doing the same thing. Now, 12 years later, and Greg and I have set sail. But, the world has change so much since my first desire to sail and we have not disappeared or fallen off the grid. These days it seems like it is actually very hard to fall off the grid unless you are really trying. I spent a few weeks on a commune in the 80s and met people who did disappear from all of their problems, responsibilities and family, but with modern communication, I bet those responsibilities and family could find them now. Greg and I are still connected to our friends and family through our cell phone, text messaging, email, the internet and some 250 plus combined friends on Facebook, most who we actually know and many who would drive us to the airport if we asked. Once one of Gregâ€™s nephews posed a question on Facebook, â€œWould you give up the internet for a million dollars?â€ Most people responded â€œno,â€ but I said â€œyes!â€ Iâ€™d buy a boat and set sail. Who needs the internet? I was wrong. I miss my family, friends and keeping up with Cabbagetown. I appreciate that people read this blog, which gives me motivation to continue to chronicle our journey and share it with them. Keeping up with emails and the blog has been a struggle, though. Before we left the States, I purchased a wifi booster, the Wirie, in order to get internet without having to leave the boat. It worked pretty well as we were motoring down the intercoastal waterway of Florida. But after we reached Miami it stopped working. After many emails on my android and a few phone calls back and forth with the manufacturer, we determined the problem â€“ we had broken it. Of course we had no idea we were breaking it at the time. We had taken the antennae off, which easily unscrewed from the body of the device, in order to bend the mounting bracket and mount it on the spar extending from our radar unit. Unfortunately Greg did not screw the antennae back on tight enough and water got into the waterproof enclosure. So, before we left Miami, we mailed the unit back to the Wirie people to be fixed. They were very good about the whole thing considering that we caused the problem. They said that they would fix it and charge us only for parts and shipping. We just needed to find a place to have it shipped to once we got to the Bahamas. On Monday March 19 we finally got the Wirie back. Yes! We can stop piddling around in Marsh Harbor! The hope is that this will make it easier for us to receive emails, update the blog, surf the web and keep up with our peeps on Facebook, eliminating the need to dingy ashore and hang out in a coffee shop or drink beer at happy hour in order get on the internet. Actually these things arenâ€™t such hardships so much as we are on a budget and just canâ€™t afford it. And one shouldnâ€™t spend happy hour with their head in a computer. 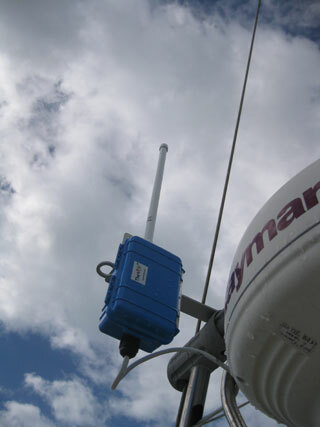 The booster is not a perfect solution as it depends on finding strong open wifi connections. Getting email is not so hard, but the blog is difficult to get on to without a good connection. But still, we will have more opportunity and time to be connected than before. Unfortunately all this modern communication has brought us sad news of late. I have recently learned of two deaths. My college roommateâ€™s mother just pasted away. I appreciate being able to receive her email out here on the water part of the grid and I hope to get a chance to send her my condolences soon. But I know she is lucky, like me, and has friends all over the world that love and care about her and that she isnâ€™t quite as alone as she might feel right now. The other death was of a friend from Cabbagetown. Jeremy was a loving, vibrant ball of uncontained energy. He is way too young to be gone and will be deeply missed by many people. Sometimes I wonder if my friend from the bar ever set sail. Maybe things got better with his wife and she went with him. Maybe he learned to completely suppress that liberal guilt and has taken up with a wild woman who is leading him on the waves a self-indulgent recklessness. I hope he is still out there and has realized his dreams, whatever they have become, and is still connected with people who care about and love him.